Paella at Jaleo by José Andrés in Las Vegas. What exactly is paella? Simply put, it’s a rice-based dish that originated in Valencia, Spain during the eighth century. Back then, it was typically made with chicken, rabbit, snails and beans, and cooked over an open fire in a ‘paellera,’ a wide shallow pan with two handles. Over the years, this one-pot meal has evolved into multiple versions worldwide and everyone has their favorites. But the best ones, whether filled with seafood or meat, are always cooked uncovered, with short-grain rice, and a good quality broth — although some purists would argue that it must be made in Valencia with the local water! Now it’s time for you to make a paella and you’re down with the short-grain rice. But, with so many other options, what else should be included? My advice is simple: choose whatever you like to eat, using the best-quality ingredients you can find. I happen to love seafood, so I usually make paella using fresh shellfish; oftentimes with the addition of sausage — usually chorizo — for the smoky, meaty flavor it adds. Other favorite additions are chicken and clams. Feel free to use the recipe below as a guideline when making your own rendition of this hearty, nourishing dish. I’m going to offer the same advice here that I did with the paella: choose a wine you feel like drinking! Think about the ingredients you’re using and take it from there. You may want a crisp white wine like a Spanish Albariño with seafood paella. Or how about a dry, crisp Sherry? The Lustau Papirusa, aged in barrels near the sea, delivers a subtle taste of the ocean — perfect for seafood. Maybe you’ll feel like a hearty red wine if you’re preparing the dish with chicken and sausage, or, with summertime approaching, rosé may be on your mind. Go for it! Rosé can pair well with just about any type of paella. I like to pair Spain’s most famous dish with its most famous red wine: Rioja. And just like paella, this tempranillo-based wine comes in many different styles. Depending on the amount of aging and the winemaker’s intentions, they range from young, fruity, and berry-scented, to complex and brooding, with subtle notes of floral spice, cinnamon and tobacco. For a humble dish like paella, look for crianza or reserva Riojas, both aged at least a year, but usually more, in barrels. These wines offer a lot of straightforward fruit flavor and vibrant acidity but, because of their aging, start to take on some tannins and complexity. I like a younger crianza with seafood paella and a richer reserva with a meat one. Look for these wines at your local shop or restaurant and on wine-searcher.com. 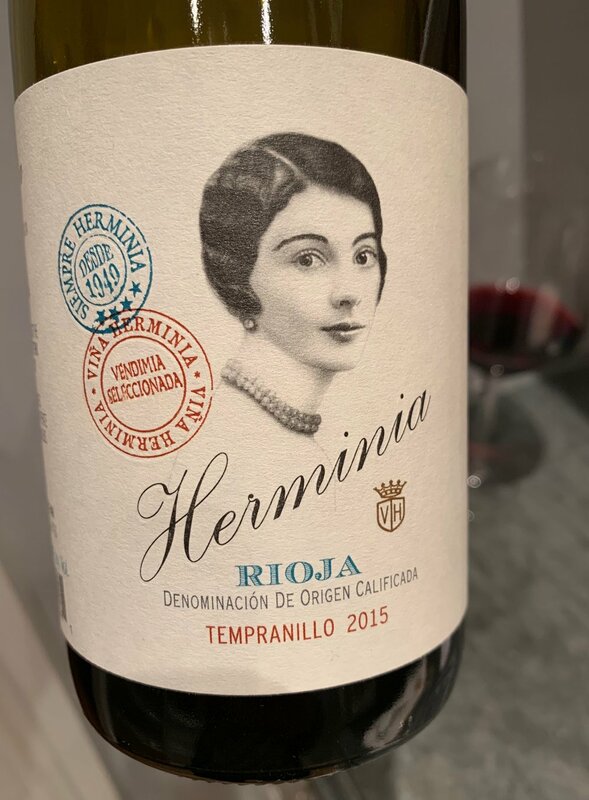 Herminia Rioja Tempranillo 2015 (lady label, $12) - Created as a tribute to an exceptional woman, the wine is a beautiful, bright ruby color with aromas of cherry fruit and a hint of tar. Round and smooth, this medium-bodied wine has silky tannins that support and enhance the cherry fruit flavors and earthiness. I love the label and the price point — you’d be hard put to find a better red Rioja at this price point! 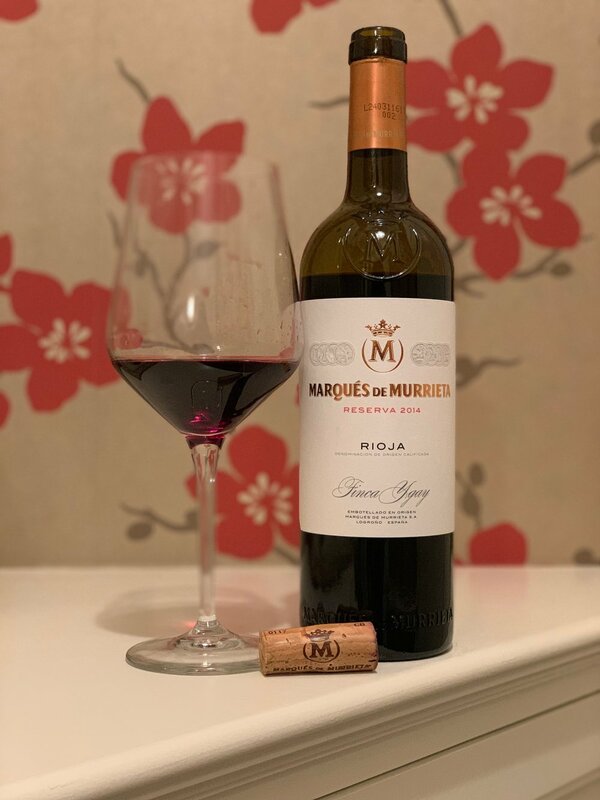 Marqués de Murrieta Reserva 2014 ($25) - This award-winning tempranillo blend has delightful aromas and flavors of ripe cherries with subtle notes of tar, ash, and earth gives this wine a beautiful complexity. Open the bottle a couple of hours before serving to let all the flavors develop. La Rioja Viña Ardanza Reserva 2009 ($35) - La Rioja Alta makes a wide range of wines and is one of the great Rioja producers. The Viña Ardanza always pleases with its soft freshness, delicate tannins and long aftertaste. Of the three recommended reds, this one has the most weight on the palate, well balanced with its bright fruit flavors. Feel like a refreshing rosé with your paella? Here are two excellent options. 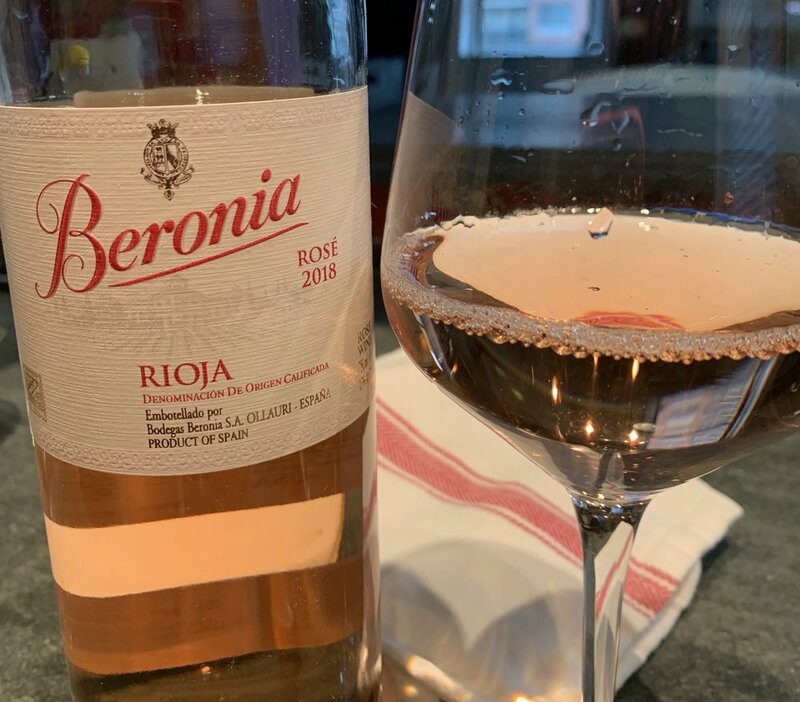 Beronia Rosé 2018 ($14 ) A beautiful light pink, salmon color, this rosé is very aromatic, with aromas of a fresh fruit salad — apples, pineapple, strawberries. On the palate, it has a medium body, loads of fresh fruit flavors and a lingering finish. Perfect with seafood, this one could be my go-to summer rosé! Vina Real Rosado 2018 ($) - The winery is a part of the famous CVNE portfolio. A medium to dark, salmon pink color, this aromatic wine is quite lush on the palate, with almost a candied sensation. The vibrant acidity keeps it fresh, though, and lets the bright fruit shine: peach, apricot, strawberry and citrus. Pair it with a paella made with meat. 4 links (about 1/2 pound) raw Mexican chorizo. You can use Spanish chorizo too. Learn the difference between them here). 1 teaspoon saffron threads, soaked in 4 tablespoons water. Make sure it’s real saffron. 1) Remove sausage casings and break up into 1-inch pieces. For Spanish chorizo, remove casings and thinly slice sausage. Heat a large paella pan (or large sauté pan) over medium heat. Add olive oil to pan. When oil is hot, add the sausage and sauté until cooked through, stirring frequently, about 6 minutes. (If using Spanish chorizo, sauté for a minute.) Remove cooked sausage from pan and put on a plate. Add onion to pan and sauté for 5 minutes until soft and golden. Add garlic and sauté 30 seconds. 2) Add paprika, turmeric and saffron (with its water) to the pan and stir, scraping the bottom of the pan. After about a minute add tomatoes, salt and peppers. Continue cooking until completely mixed in and the onions are rust colored, 2- 3 minutes. 3) Add the rice and stir until the rice is completely coated with the oil and spices. Stir in the stock. Bring to a simmer. Reduce heat to low and simmer uncovered for 10 minutes without stirring to allow the grains to soak up the liquid. Move the pan every few minutes so all parts receive direct heat and cook evenly. 4) After about 10 minutes, the rice should be almost done, but the mixture should be slightly soupy. Add more chicken stock if necessary. Stir clams and frozen peas into the rice mixture and bring mixture back to a simmer. Cover and cook for 2 minutes. Add shrimp and calamari to pan. Cover and simmer an additional 3 to 4 minutes. 5) Mix in chorizo and let sit a few minutes to warm up the sausage. Spoon Paella into individual bowls or one big serving bowl. Lay pieces of red pepper on top, sprinkle with parsley and serve.